The One Step RV IgG/IgM Test is a rapid chromatographic immunoassay for the qualitative detection of antibodies (IgG and IgM) to Rubella (Virus) in Whole Blood /Serum / Plasma to aid in the diagnosis of RV infection. 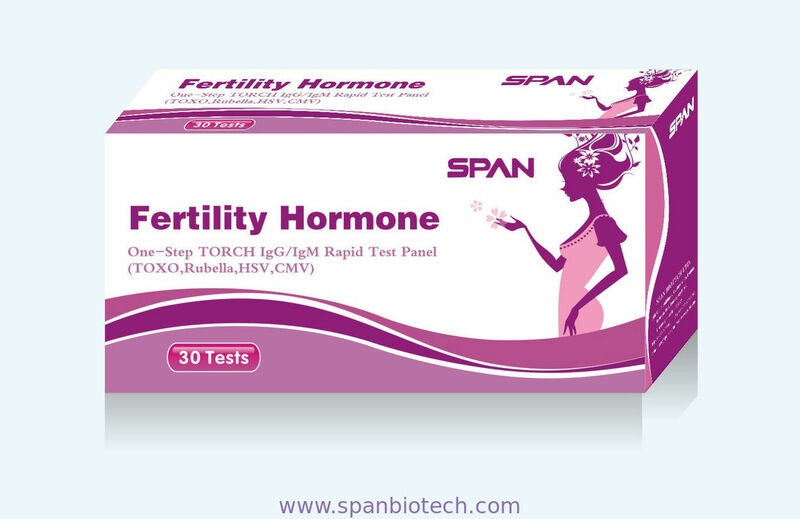 The test is based on immunochromatography and can give a result within 15 minutes. The One Step RV IgG/IgM Test is a qualitative membrane strip based immunoassay for the detection of RV antibodies (IgG and IgM) in Whole Blood /Serum / Plasma. The test device consists of: 1) a burgundy colored conjugate pad containing RV recombinant envelope antigens conjugated with Colloid gold (RV conjugates) and rabbit IgG-gold conjugates,2) a nitrocellulose membrane strip containing two test bands (T1 and T2 bands) and a control band (C band). The T1 band is pre-coated with the antibody for the detection of IgM anti-RV, T2 band is coated with antibody for the detection of IgG anti-RV, and the C band is pre-coated with goat anti rabbit IgG. When an adequate volume of test specimen is dispensed into the sample well of the test cassette, the specimen migrates by capillary action across the cassette. IgG anti-RV, if present in the specimen, will bind to the RV conjugates. The immunocomplex is then captured by the reagent pre-coated on the T2 band, forming a burgundy colored T2 band, indicating a RV IgG positive test result and suggesting a recent or repeat infection. IgM anti-RV if present in the specimen will bind to the RV conjugates. The immunocomplex is then captured by the reagent coated on the T1 band, forming a burgundy colored T1 band, indicating a RV IgM positive test result and suggesting a fresh infection. Absence of any T bands (T1 and T2) suggests a negative result. The test contains an internal control (C band) which should exhibit a burgundy colored band of the immunocomplex of goat anti rabbit IgG/rabbit IgG-gold conjugate regardless of the color development on any of the T bands. Otherwise, the test result is invalid and the specimen must be retested with another device. Do not eat, drink or smoke in the area where the specimens and kits are handled. Handle all specimens as if they contain infectious agents. Observe established precautions against microbiological hazards throughout all procedures and follow the standard procedures for proper disposal of specimens. Follow standard biosafety guidelines for handling and disposal of potential infective material. The One Step RV IgG/IgM Test can be performed used on Whole Blood /Serum / Plasma. To collect whole blood, serum or plasma specimens following regular clinical laboratory procedures. Testing should be performed immediately after specimen collection. Do not leave the specimens at room temperature for prolonged periods. For long term storage, specimens should be kept below -20℃. Whole blood should be stored at 2-8℃ if the test is to be run within 2 days of collection. Do not freeze whole blood specimens. Place the test device on a clean and level surface. Hold the dropper vertically and transfer 1 drop of specimen (approximately 10μl) to the specimen well(S) of the test device, then add 2 drops of buffer (approximately 80μl) and start the timer. See illustration below. Positive: Control line and at least one test line appear on the membrane. The appearance of T2 test line indicates the presence of RV specific IgG antibodies. The appearance of T1 test line indicates the presence of RV specific IgM antibodies. And if both T1 and T2 line appear, it indicates that the presence of both RV specific IgG and IgM antibodies. The lower the antibody concentration is, the weaker the result line is. Negative: One colored line appears in the control region(C). No apparent colored line appear in the test line region. The One Step RV IgG/IgM Test is for in vitro diagnostic use only. The test should be used for the detection of RV antibodies in Whole Blood /Serum / Plasma specimens only. Neither the quantitative value nor the rate of increase in RV antibodies can be determined by this qualitative test. The One Step RV IgG/IgM Test will only indicate the presence of RV antibodies in the specimen and should not be used as the sole criteria for the diagnosis of RV infection. If the test result is negative and clinical symptoms persist, additional testing using other clinical methods is recommended. A negative result does not at any time preclude the possibility of RV infection.